On-Demand Indexing -On-Demand Indexing lets you get a select number of pages on your website indexed quickly. You can have the latest version of these pages included in your Google Site Search within 24 hours. Enhanced Index Coverage -Enhanced Index Coverage ensures comprehensive search results on any website by crawling and indexing more content, even for pages deep within a site. Synonyms -Enable visitors to find documents with related terms without having to issue multiple queries. You can easily upload synonym dictionaries specific to your website. For example, (a search for [car] will now include [cars]). You can easily upload a custom synonym dictionary (a search for [fd] would include [fixed deposits] in search results). Date Biasing -From now on, administrators can influence their search ranking based on the age of the documents (e.g., a recent product datasheet is weighted more heavily than older product documents). This feature can also be disabled and administrators can decide the level of influence for their sites (low, medium, high or maximum). I was not able to get the full experience and see all the uses of Google Site Search given that you have to pay to put it on your web page. From what I read about it, however, I've concluded that it's a really great idea for any business that has a decent amount of routine visitors to its website. I would say a feature like or similar to this is essential for any company whose website has over a thousand visitors a day. A tool like this brings together what can be a lot of disconnected pages, allowing a shopper to find what they need, thus making their visit much more convenient. You can clearly do a lot more with Google Site Search than you can with Google Custom Search. As times passes, it is likely that Google will add more features to its Site Search making it more useful to businesses that host visitors on the Web. If you are an entrepreneur looking to create a business that incorporates the Web (as most any good business should), Google Site Search is a resource and tool to be aware of. 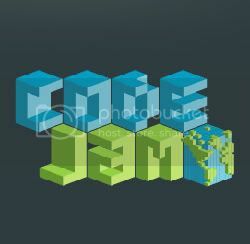 I am a big fan of Google Earth and have been using it in different ways for some time now. Google Earth is an awesome tool that combines photographs from satellites and compiles them into a real-life world map. You can view anywhere on Earth (with varying degrees of clarity) at the touch of a button. How about a quick tour of the world? I've found Google Earth to be helpful on several occasions, but most of the time I use it to map routes for running and biking. Inside the program, I use the path drawing tool to create, view, and calculate the distance for certain running routes throughout the area. Using Google Earth allows me to figure out how far I will be running, what I will see while running, and how difficult the run may be. Fly around the city using Google Earth's unique navigation. Ancient Rome 3D is the first ancient city to be added to Google Earth and it contains one of the most extensive collection of three-dimensional buildings of any city within the program. This historical project has been developed by Google with collaboration from Past Perfect Productions, the University of California, Los Angelos, the University of Virginia, and the Institute for Advanced Technology in the Humanities. Download Google Earth and learn more about Ancient Rome 3D. 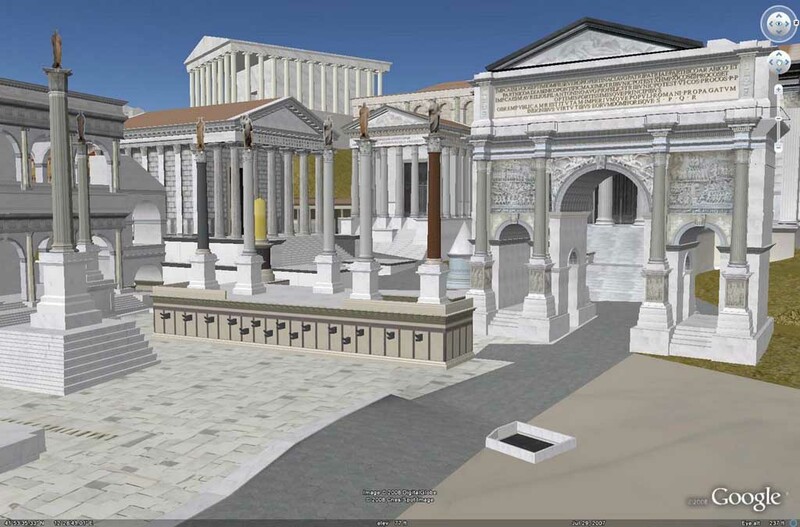 To view Ancient Rome 3D, users should click on the "Layers" panel of Google Earth, select "Gallery," then "Ancient Rome 3D." For a youtube video describing further features of the application click here. I think this is a great idea, however I did not find the Ancient Rome 3D application to be all that user friendly, or interesting. While navigating inside Google Earth I couldn't find out how to get rid of the existing structures and only see what was in place centuries ago (I'm not sure if this feature is possible at all). Similarly, I was most interested in just seeing the general layout of the ancient city including where the majority of buildings were located and whatever else stood out to me. This was hard to do though given the limited number of 3D buildings that actually showed up and all the new structures from modern day Rome that got in the way. Even though my experiences with Ancient Rome 3D were not the best, I'm sure further additions and new updates will make the whole program a lot more usual, easier to navigate, and a whole lot more interesting. Ancient Rome is an obvious choice for a historical city to model and incorporate into Google Earth. I am interested to see what other cities or features will come next. Something that would be really cool would be for Google to use their satellite photographs and group them by time period. This way a user could view the geography and features of certain areas during different periods of time and get an idea of how that area has progressed. Last Friday, Google concluded its hosting of the Google Code Jam finals, an event which invited 100 of the world's top programmers to show their skills in a grand coding competition. The fifth annual hosting of this event began with over 11,000 contestants who attempted to solve complex algorithmic challenges by programming in the language of their choice. During July and August, the top 500 semi-finalists did battle in regional competitions at 15 offices across Europe, Asia, and the Americas. A final 100 programmers were selected for the finale in Mountain View, California, home to Google's headquarters. After three hours of typing, debugging, and problem solving, Tiancheng Lou of China won the grand prize of $10,000. The Chinese also won second place, and Bruce Merry from the United Kingdom came in third. In total, the 100 finalists represented 23 different countries. Neither am I a serious programmer nor do I plan to be, but I thought this bit of news was interesting. I've always kind of admired people who can do crazy things with computers and make all sorts of programs. It really is a complicated art that takes skills not everyone poses. Google is branching out and finding so many ways to get involved and potentially grow their business. Although I had never heard of the Google Code Jam before, I am not surprised that its been happening. As far as the contest goes, all top 100 finishers were awarded a cash prize. I wouldn't be surprised, however, if Google turned around and gave some of these people a job, or at least kept an eye on them. Another noteworthy point about the competition comes from the fact that of the 100 finalists, 23 countries were represented. This really shows how widespread and universal computers are becoming, and how succeeding in business and a lot of things these days depends on them. Soon enough, people everywhere will be connected by computers and through the internet. On a final note, if any of you out there have an great interest in computers especially complex programming you might want to enter into next year's competition. A free trip would be great and you have nothing to lose, so its worth a shot. I ran across this news clip pertaining to Google and I thought that some people might be interested in it. I know our class has an employee from Google coming in to speak next week, but this is another great opportunity to hear from some of Google's talent. Senior Vice President of Google and President of EMEA Operations, Nikesh Arora (biography here) will participate in a question and answer session at the Eighth Annual Morgan Stanley Technology, Media, and Telecoms Conference in Barcelona. The session is scheduled for 3:45am Eastern Time on Friday, November 21, 2008. Here you can access the live audio webcast. Although the initial airing of the live webcast on Friday at 3:45am isn't the best time, I'm sure the audio webcast can be listened to later on. I would like to check this out and hear what Nikesh has to say. After viewing his biography its safe to say that Mr. Aurora has a long list of accomplishments. This is pretty much true for all of Google's top employees, as many have graduated at the top of their class from multiple prestigious universities. Given this, I always think it's a great opportunity when you have a chance to hear someone from Google speak. I'm glad that the audio webcast is in a question and answer format because then you have no one idea what to expect. Unfortunately you don't have the chance to ask questions yourself, but I bet there will still be many exciting and informative questions asked by others.